Brief Description of Subject: Description: In lens at top of picture is an angel with a shield that has a picture of a descending dove -- the Holy Ghost. Next lens down is a picture of the third Joyful Mystery of the Holy Rosary -- the Nativity. Shepherds are seen with their sheep (slightly below them and to the left) while looking at the star of Bethlehem. 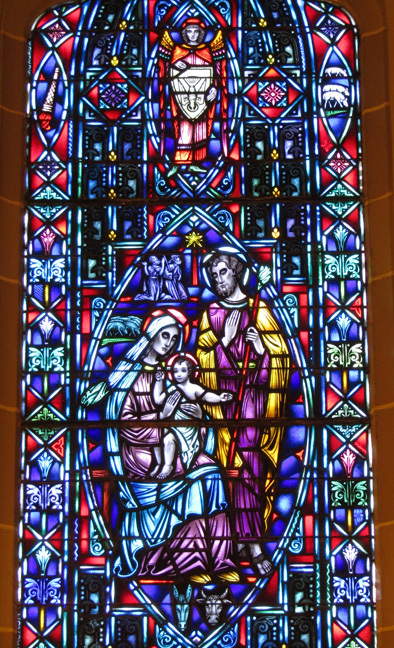 Mary holding the Christ Child is seen in a stable (animals below them). Christ is pointing to heaven and Joseph is seen with a flowering staff (chosen by God). 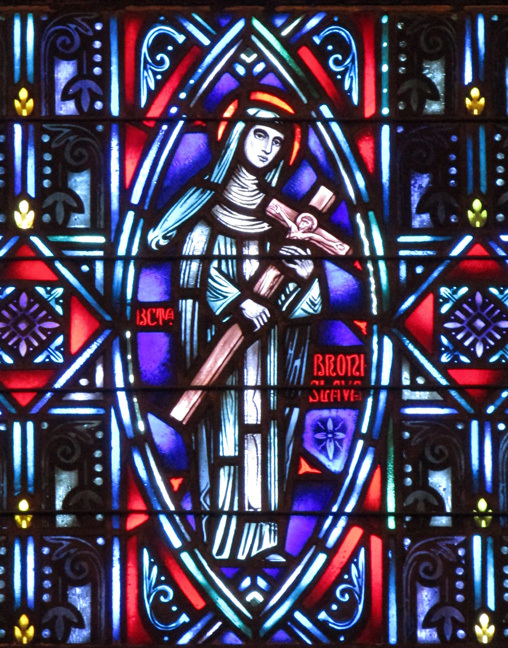 The next lens down is seen the Blessed Bronislava of Poland with her attributes -- dressed in the habit of the Norbertines and carrying a cross -- when barbarians attacked Krakow, Bronislava, with cross in hand, told her fellow sisters "Do not be afraid, the Cross will save us." 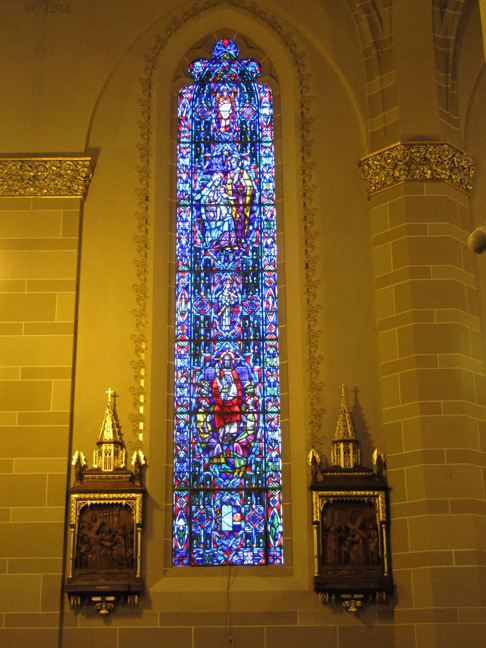 Next lens down is a picture of the third Luminous Mystery of the Holy Rosary -- Proclamation of the Kingdom of God. Luke 2:1 -21 Jesus tells the apostles "Proclaim this message "The Kingdom of Heaven has come near." Mark 1:14-15 Jesus says "The time is fulfilled, and the kingdom of God is at hand: repent ye, and believe the gospel". 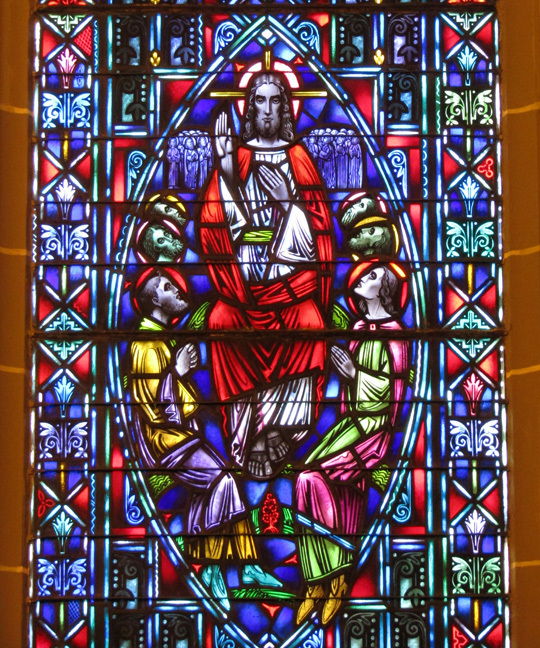 Jesus is seen telling 6 of the apostles to preach the gospel in the background are those that have gone to heaven (they have haloes). The hexagon at the bottom contains a picture of the 10 commandments (note the 4 that pertain to God on one side of the tablet) and Noah's ark. The Lord spared Noah and his family but wiped out the rest in a flood as punishment for not following his commandments. 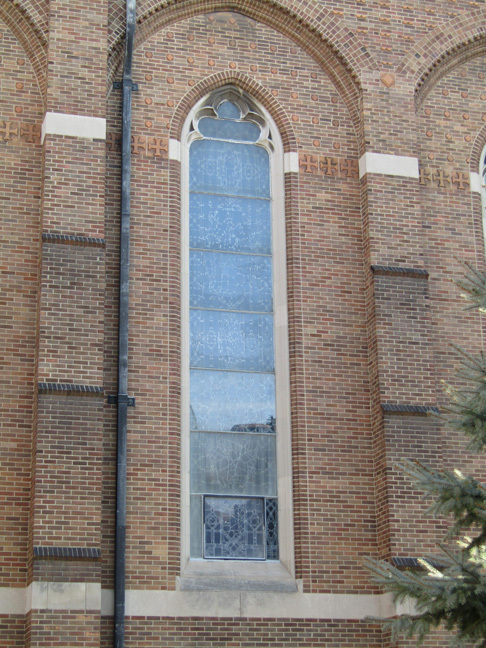 The border on all of these aisle windows contain 4 lenses -- 2 on top, 2 on the bottom. 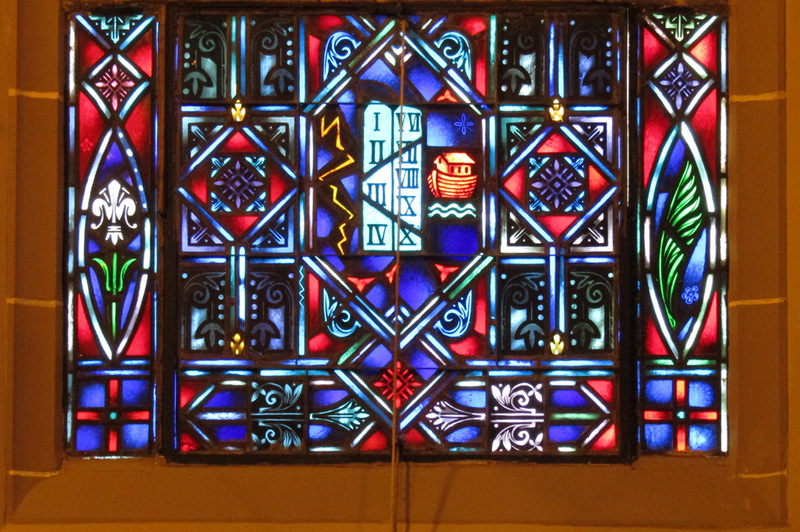 On this window, at the top are a lit torch and sheep and at the bottom a fleur-de-lis and a palm frond.